Argentina's President Cristina Fernandez de Kirchner and Venezuela's President Hugo Chavez applaud after signing bilateral accords in Miraflores Palace in Caracas. A Kinder, Gentler Hugo Chávez? Sitting in a Florida steakhouse a year ago this month, millionaire Venezuelan oilman Frank Duran allegedly gave his friend Guido Antonini Wilson a dark warning. "A moment might come," Duran said, "when nobody can save Antonini's skin." Antonini, a Venezuelan businessman with U.S. citizenship, was indeed in a jam. A month earlier, he'd arrived in Buenos Aires on a chartered flight with Argentine energy officials and executives of Venezuela's state-run oil company, Petroleos de Venezuela (PDVSA). Argentine customs agents then caught him with a suitcase stuffed with $800,000 in cash. Antonini was allowed to return to the U.S.  but it seemed the entire hemisphere wanted to know if he'd been carrying the money for Venezuelan President Hugo Chavez as some sort of bribe for the Argentine government. Today, however, it's Duran whose legal skin that needs saving. Last December he and four other men, three Venezuelans and an Uruguayan, were charged in Miami with failing to register as foreign government agents. 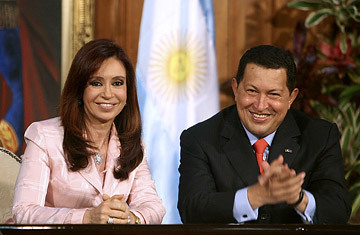 U.S. prosecutors say the men, at the behest of "high-level" Venezuelan government officials, cajoled and even threatened Antonini to keep mum about the real purpose of all that cash: an illegal contribution from Venezuela to the presidential campaign of then Argentine Senator and First Lady Cristina Fernandez de Kirchner, a Chavez ally. One of the men, Moises Maionica, pleaded guilty in January; one is at large and another  Carlos Kauffman, a close Duran pal  pleaded guilty in March, leaving Duran all but alone to face trial in Miami that began this week. Both backers and critics of Chavez say the radical left-wing Venezuelan President is tacitly on trial himself. It's no secret that Chavez, who controls the hemisphere's largest oil reserves, lavishes billions of dollars in foreign aid on allies to promote his anti-U.S. Bolivarian Revolution. Foes have long groused that his largesse can also be as shadowy as the covert U.S. operations Chavez accuses agencies like the CIA of perpetrating. They contend that he has funneled cash to leftist candidates in presidential races from Bolivia to Mexico, and that he has helped fund Marxist guerrillas like the FARC in Colombia. Chavez has just as adamantly denied those charges, as have his supposed beneficiaries. It wasn't until Antonini's luggage was opened in 2007  and until Colombian authorities claimed last spring that seized guerrilla laptops revealed Chavez payments of as much as $300 million to the FARC  that alleged evidence of Caracas' covert dealings had ever surfaced. The top prosecutor on the Antonini case, Assistant U.S. Attorney Thomas Mulvihill, has said in hearings that conversations recorded by an FBI wire that Antonini wore prove the suitcase money "was meant for the campaign of Cristina [Fernandez]." And according to court documents filed this summer, Kauffman is expected to testify they were told by high-level Venezuelan officials that Chavez was personally involved in the alleged suitcase affair and its aftermath. One question Chavez supporters ask is why Fernandez would even need his cash when she held a more than 20-point lead in voter polls leading up to last October's election, which she won handily. When the campaign contribution allegation was made shortly after her inauguration, she took it as a Yanqui affront to her own government and angrily called the case a "garbage operation." The Casa Rosada, the Argentine presidential palace, insists instead that the U.S. should extradite Antonini to Argentina. Indeed, the acid relationship between Chavez and the U.S. has also thrown the Bush Administration's motives into doubt. Thomas Shannon, U.S. assistant secretary of state for western hemisphere affairs, has insisted the indictments stem purely from "a judicial process" and not politics. Venezuela and defense lawyers claim otherwise. Chavez, who accuses the White House of backing a failed 2002 coup against him, calls the case "part of the U.S. empire's plan" to smear him. Duran's attorney, Edward Shohat, argues that the statute at play  acting, or conspiring to act, as a foreign agent without permission  has been used only when espionage or a threat to U.S. security was involved. "The U.S. has no security interest in this matter," he says. "This case is political." One of the Cessna's passengers claims that two days later Antonini joined them at a reception in the Casa Rosada. Argentine officials dispute that. Either way, Antonini returned home to Key Biscayne, Florida, scared enough to cooperate with FBI agents. For the next four months they monitored his meetings and calls with Duran, 40; Kauffman, 35, a Venezuelan partner of Duran's in oil products and drilling equipment firms; Maionica, 36, a Venezuelan lawyer; Antonio Jose Canchica, 37, an agent of the Venezuelan intelligence service, DISIP; and Rodolfo Wanseele, 40, an Uruguayan and Canchica's driver. Maionica and Kauffman face a maximum five years each in prison; Canchica is at large; and Duran and Wanseele, who have pleaded not guilty and are set to go on trial on Tuesday, face a maximum 10 years each. Court documents allege Maionica confided he was "brought into the conspiracy by a high-level official of DISIP." They say Kauffman and Duran  who own ritzy Florida homes, enjoy racing Ferraris and are part of what Venezuelans call the revolution's "Boli-bourgeoisie"  issued thinly veiled threats. They warned that "foreign government authorities would pursue Antonini" if he talked, and that it was in his children's best interest that he have "no problems" with Venezuela. At one cloak-and-dagger gathering, Canchica, using the name "Christian," allegedly told Antonini that PDVSA (the Venezuelan oil corporation) and the Chavez government would make his legal problems vanish. Mulvihill claims to have 41 audio recordings and eight videotapes to play at trial; and the Maionica and Kauffman guilty pleas suggest that evidence may be as potent as he suggests. Then again, Duran and Wanseele might be risking a trial partly because they know Mulvihill also charged Fidel Castro in the late 1980s with aiding Colombian drug traffickers, an accusation that was never proven. Either way, Chavez and the U.S. may both face more scrutiny this month than either bargained for.